Mais Corvino, from 40 seeds to 1.3m plants. 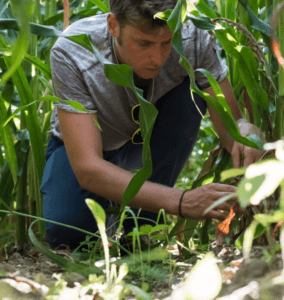 Carlo Maria Recchia – born in 1993 – is a very young entrepreneur who built his fortune from an ancient passion, love for the land and for agriculture, which led him to be the first and only producer and distributor of the this black corn Mais Corvino throughout Europe. In an era in Italy where you hear about youth unemployment and activities in continuous failure, Carlo Maria Recchia is the example of a young man who has not only chosen to remain in Italy but to invest in its territory and revert to a contemporary a very ancient trade: the farmer. Since the age of 17, following a discovery made during a research project for the school – Istituto Tecnico di Agraria, Crema – he has dedicated himself more and more to the rediscovery and cultivation of the Mais Corvino, a type of black corn which dates back to the time of the Maya, with significant nutritional properties, which in Europe has not been cultivated since 1700. In 2014 Carlo formed a company called CMR and Mais Corvino was born, an agricultural enterprise of Carlo Maria Recchia, which becomes a direct grower of Mais Corvino of Coldiretti. The Corvino corn plants are then cultivated in 3,000 square meters, in the countryside around Cremona. The corn grains are ground to stone in an historic mill, La Grande Ruota of 1857, by Dello.Il Mulino (the mill) was designed with the aim of further preserving the raw material and its organoleptic properties during the processing phase; thanks to the combination of a stone milling of the cereal – “like that of the past” In addition to flour, CMR Mais Corvino starts the production of pasta and a gluten free beer. 2017 is the year of a new turning point: Carlo Maria Recchia joins the company with Massa di Leoni Srl, a Branded Content agency founded by Luciano Massa and Luca Leoni, and this is how the individual company CMR Mais Corvino becomes a real company, the Corn Corvino Srl. The union of these two and the key know-how of agriculture and digital communication represents in reality the perfect synthesis of innovation of the project by Mais Corvino Srl: a new and revolutionary way of doing business, where the recovery of the past becomes a trend thanks to the foresight and technology in the hands of this young entrepreneurial generation. Eat better not less is not a slogan but a message of food education. “We are what we eat”, our life and our physical and psychological health, vary according to our diet. Healthy eating is both a right and a duty to be guaranteed to the entire world population. World estimates say that in 2050 the planet will be populated by more than 9 billion people but, to date, we can not guarantee the minimum amount of food for the survival of more than a billion people. The awareness of these issues is the first tool that man has available to address the problem of hunger in the world. The corporate spirit of Mais Corvino Srl supports this position and is committed to enhancing the issues related to nutrition, the protection of nature and mother earth. Mais Corvino is an ancient cereal, with a black and elongated grain, cultivated by the Maya already in the 3500 A.C. 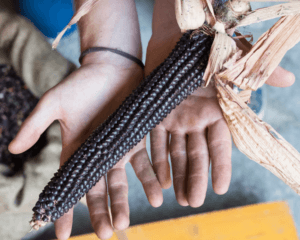 Compared to common corn, this unique variant contains twice as many proteins, 20% less carbohydrates, 20 times antioxidants, equal to those contained in blueberries. In particular, Corvino Corn is rich in flavonoids, beta-carotene, vitamin A and is gluten-free. Thanks to Carlo Maria Recchia, who in 2010 manages to have the first 40 seeds of the ancient cereal and for the next two years he cultivates them to multiply them and start production, since the first 40 plants in 2011 he has now managed to plant 1.3m of these unique ancient and prestigious black corn bearing plants to transform into flour so that today we can enjoy this wonderful food across Europe. 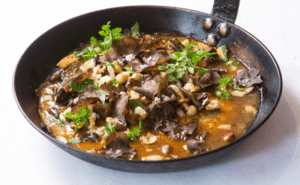 A beautiful recipe by Francesco Mazzei can be found here by clicking the link. Francesco having the first dish on a UK menu with Mais Corvino back when he open Sartoria two years ago.